Wanting to get hired? Looking for creative job hunting but they just aren’t working? If the answer is yes, then this is the post you must be reading. 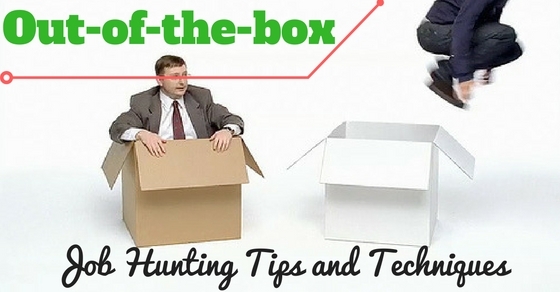 In this article we will mention some really out of the box and effective job search tips that can not only help you have a better resume but also stand out among the rest. The job hunting tips and ideas enlisted in this post are creative, have been tried by many and have worked wonderfully. You must definitely give them a shot. Go ahead and read them below. How to be Out of the Box with your Resume? When it comes to writing down a good cover letter, you have to keep in mind that the recruiting manager will be reading all of it and since they read a lot of them every day, it might get a bit monotonous to read yours. Therefore you must keep the cover letter professional and write down bits of your personality. Remember to come up with an engaging letter and don’t remember to put some colour in it. Having a proper cover letter would make the person think you are a fun person to work with. They will automatically want to hire you. The recruiters will always like and appreciate those candidates who will demonstrate and prepare from beforehand. They should be well read and have some knowledge of the company. This is also known as pain points to some people. Remember to create a clear connection between the needs of the company and the skills you have. Add the accomplishments as well and in that you will surely have a good impression and be above most candidates. Another way you can show how perfect you are for the job is by showing that you perfectly fit the position and have a good understanding of the goals of the company. You could also mention a couple examples of the experiences you have had in the past and how you can perfectly fit the organization. That would make things clear for the person who is hiring you and they would definitely want you. A lot of people don’t give proper examples. You could become a real winner if you mention some real examples. How to be Out of the Box with a Good First Impression? What we think can really help you, to make a good impression is by imitating a little. When you start to pick certain attitudes and behaviour from your boss, they will automatically help you make a better connection with the stranger. An example can be used to explain this. If the interviewer is full of energy and uses a lot of gestures, then you can express that level of liveliness as well. In case the questions aren’t serious and calm, you can tame down your energy a bit and try to match with them. Next you must pay close attention to the body language. Take a close look and try to understand body language of your interviewer. Try to see the way in which they speak and present themselves. If they begin to say, they are open to having new ideas but you find them sitting with their legs and arms crossed, then you obviously have to question them. Next if they say that they possess excellent management skills but when you really see them behaving like leaders, it would be difficult to trust them. Same applies for you. If you don’t have the correct body language, nobody is going to believe you. Next, you must remember to be as social and as friendly as possible. Make good eye contact, smile and tell them your name and then shake your hands with them. Then you should listen to the name of the person and then use it a few times when you are really speaking. This will not just help the recruiting manager remember you but you will also get to see some sort of interest in the conversation on their behalf. It is completely alright for you to ask others for advice. There are times when we believe that we might have to sell ourselves as someone who knows everything in order to get a job but in recent times I have also found out that the best way to build a new relationship with people you would like to work with, is by simply being vulnerable. And by that we mean that you should share information regarding work and ask regularly for advice. Adney, an expert in these cases also says that he recommends doing such jobs with company professionals that you would like to keep working for much before they have any job openings. Even though a lot of people tell you to follow your passions, there is no need for you to always do so. Even experts have mentioned the same thing in the past. If you go and study about people who love their work, you will find out that several of them do not even follow any sort of pre existing passion. What you will see is that the passion they have worked on all this while has actually developed and got much better. They helped them take better control over such an important stage in their lives. Experts have also said that job seekers or the people looking for a job must at times, disregard the passions they have. Third, don’t ever keep waiting around for your dream job to happen. Go ahead and start working on it. You should study the field you want to work in and then see the company you would like to become a part of in the future. All of this matters a lot in the long run. Once you are done with that, you should figure out those challenges that could occur and how you can deal with them the right way. With that, you can come up with a solution and share it directly with those who are working on a blog. The whole concept here is to get things noticed, offer a solution without hoping to get any of it in return. If you can do that, it will help. One of the best and most powerful out of the box job search tips is using LinkedIn. This happens to be one of the best social networks that helps career professionals a lot. LinkedIn may be used as a wonderful resource for connecting with others at companies which you may be interested in. The whole key here is to manage all connections with professionals as much as you can. Direct connections in fact are very helpful. In case you want to work on Facebook, you may actually use your LinkedIn connections to connect with people there. Secondary connections are also helpful. Before you begin to finalize your resume, make sure to check the resume samples properly. Before you review other resumes, you can also get hold of a few ideas that can help you enhance the content. It will help your resume look better. The feel of it will also improve. Looking at most resume samples will help you identify such areas where you can work your expertise or even enhance the way in which you can present yourself to other employers. You may use Twitter to search for jobs and it can actually help you land something good. Go and search for the company you want to work for and see what they have to offer. There are several Twitter profiles that will come up. All of this can really help you. Once you have got hold of the person, follow the company on Twitter. You can also mention some of them so that they connect with you if the need arises. Apart from that, people can also use their email so that the company gets in touch with you in a faster way. Twitter in short is a very creative and smart way to get hold of the job you want. There is really no need to use tunnel vision and look for a certain kind of job. If you don’t have a job presently and are looking for job at the moment, go ahead with what you get. You may have to check out a few types of job titles that you would like to consider. When there are few areas you are about to consider, it will also open up several options and you will have interviews and call backs. You must always remember that every interview is a great opportunity to get the job and also make new contacts. Using several resumes can actually help you get a job faster. Resume templates for example is a quick way! You can mention all important information right there. They also let you have several resumes for the kind of jobs you would like to have. The area in which the resumes shall differentiate themselves will be on the basis of resume structure, objective and job details. The resumes structure must be a highlight. The objective must also target directly to the kind of job you are hoping to apply for. The details of the job will explain the accomplishments in your past jobs and the experiences and skills that you have. If it matches with them, you will automatically be called for an interview. When you are applying for a company, especially if it has recently kicked off, you must always consider accepting the different packages. If you are offering yourself to an employer who has paid you depending on the commission or one that is based on some different kind of measurement of performance, the employer will be happy to hire you. And apart from that, it would become a much bigger reward if you end up getting the job and make some good money out of it. There are times when small business are found on Craigslist and you can check it out there. They help you find jobs much faster, especially if it is a small thing or maybe just a startup. It is simple, cheap and has helped a lot of people land something good. Even though they are underrated, you could try them for better networking. There are several people who have tried Craigslist and praised it. You will find some benefit from there as well. This brings the post to an end. If you have liked reading the article and found some help from it, do let us know in the comment box below. Also there could be a few questions you have in mind. Drop them down and we will get back to you very soon. Always remember that job hunting is challenging task but you can definitely make that simple by simply following the job hunting tips and ideas mentioned above. They are useful and have helped a lot of people in the past. We promise it will do the same to you. Just give it a shot!